BURBANK, CA (April 18, 2013) - The world is turned upside down as one of earth's greatest super heroes - Flash - wakes up devoid of his super powers in the all-new Justice League: The Flashpoint Paradox - the next entry in the popular, ongoing series of DC Universe Original Animated Movies. Produced by DC Entertainment and Warner Bros. Animation, this all-new, PG-13-rated film arrives July 30, 2013 from Warner Bros. Home Entertainment on Blu-Ray(TM) Combo Pack ($24.98 SRP), DVD ($19.98 SRP) and Digital Download. The Blu-ray(TM) Combo Pack will include UltraViolet(TM)*. When time travel allows a past wrong to be righted for Flash and his family, the event's temporal ripples prove disastrous, creating a fractured, alternate reality where the Justice League never formed, and even Superman is nowhere to be found. Amidst a new world being ravaged by a fierce war between Wonder Woman's Amazons and Aquaman's Atlanteans, Flash must team with a grittier, more violent Batman and government agent Cyborg to restore the continuity of Flash's original timeline. "Justice League: The Flashpoint Paradox has all the elements of another great film - dynamic forceful villains, treacherous twists and turns and internal tensions amongst heroes," said Mary Ellen Thomas, Warner Home Video Vice President, Family, Animation and Partner Brands Marketing. "Showcasing a cast that brings together some of today's popular primetime television actors with many fans' favorite voices from the original series, Warner Bros. Home Entertainment is proud to release this title as the next DC Universe Animated Original Movie." Primetime television stars Justin Chambers (Grey's Anatomy) and Kevin McKidd (Grey's Anatomy), the voices of Barry Allen/Flash and Thomas Wayne/Batman, respectively, unite with numerous greats of television and film to fashion the famed animated roles. Adding to the celebrity-laden voice cast and providing thrilling additions to the Justice League series are Michael B. Jordan (Fruitvale, Friday Night Lights, Chronicle) as Cyborg, C. Thomas Howell (Southland, The Outsiders) as Thawne/Professor Zoom, Nathan Fillion (Castle) as Hal Jordan/Green Lantern, Ron Perlman (Hellboy) as Slade and Deathstroke, Dana Delany (Body of Proof) as Lois Lane, Cary Elwes (The Princess Bride) as Aquaman, Danny Huston (Magic City) as General Lane, Sam Daly (The Office, The Daly Show) as Superman, and Kevin Conroy (Batman: The Animated Series) as Batman. 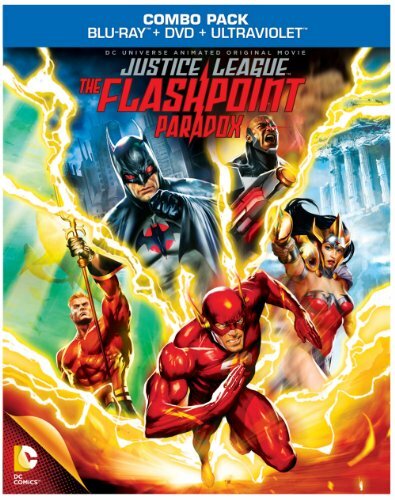 Screenwriter Jim Krieg delivers an action-packed vision of the legendary comic book miniseries FLASHPOINT, by Geoff Johns & Andy Kubert, adding to the over 13 million DC Universe video units produced to date. Jay Oliva (Batman: The Dark Knight Returns) is director and James Tucker (Superman: Unbound) is producer. * A Flash in Time: Are there other dimensions? Can time travel get us there? And if The Flash existed, could he really travel through time? Interviews with experts in mythology, theoretical physics and top DC writers will examine the science and legacy of the storytelling behind the fiction. * My Favorite Villians! The Flash Bad Guys: Acclaimed DC Comics writer Geoff Johns and others share their favorite Flash villains in this short film that gives viewers a glimpse into the Flash's world through the eyes of some of the nefarious characters he has encountered over the past 70 years! * A Sneak Peek at the next DC Universe animated movie:. An in-depth look into the next DC Animated feature film, spotlighting the cast and crew. Warner Bros. Animation (WBA) is one of the leading producers of animation in the entertainment industry, with an innovative and talent-rich roster boasting some of the most accomplished writers, producers and artists working today. The studio is on the cutting edge of animation technology and has both CG and traditionally animated projects in current production and development. For TV, WBA produces series such as The Looney Tunes Show, MAD and Teen Titans Go!, as well as the forthcoming Beware The Batman,and The Tom and Jerry Show for Cartoon Network. WBA also produces series and additional original content -- including animated shorts -- for Cartoon Network's multiplatform branded DC Nation programming block. In addition to TV programming, WBA produces theatrically released CG cartoon shorts featuring iconic Looney Tunes characters, rendered in stereoscopic 3D. WBA also creates the highly successful series of DC Universe Original Animated Movies for DVD. Producing for multiple platforms including TV, digital and home entertainment both domestically and internationally, WBA is highly respected for its creative and technical excellence, as well as for maintaining the Studio's rich cartoon heritage. It is also the home of the iconic animated characters from the DC Comics, Hanna-Barbera, MGM and Looney Tunes libraries. One of the most-honored animation studios in history, WBA has been honored with six Academy Awards(R), 35 Emmy(R) Awards, the George Foster Peabody Award, an Environmental Media Award, a Parents' Choice Award, the HUMANITAS Prize, two Prism Awards and 20 Annie Awards (honoring excellence in animation).